No matter how hard you work to preserve your youthful appearance, at some point your skin betrays you and starts heading south. You may be sporting a sagging jawline, floppy “wings” on the backs of your arms, loose skin on your legs or an unwelcome tummy or bra-line roll. Fear not, ThermiAesthetics™ is here! 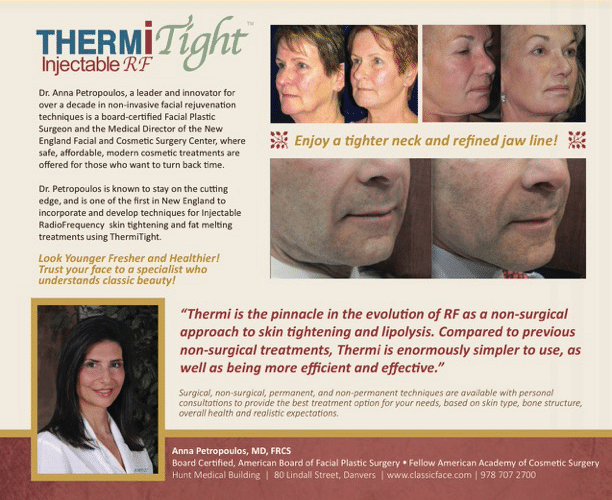 Dr. Anna Petropoulos, a leader and innovator in radiofrequency treatments, is pleased to offer ThermiRF radiofrequency skin tightening and contouring, at her suburban Boston facial plastic surgery practice. Depending on your skin tightening needs, you have the option of ThermiSmooth™, which is completely non-invasive, or InjectableRF™ with ThermiTight™ which can be the next best option before surgery. Dr. Petropoulos is considered the authority in achieving aesthetic enhancements with the radiofrequency modality, given her 15 years of experience using a wide array of radiofrequency treatments for skin tightening and contouring. 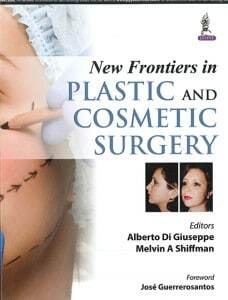 Because of her specialized expertise, Dr. Petropoulos was asked to co-author a chapter on this innovative technology for the medical text New Frontiers in Plastic and Cosmetic Surgery. If you’d like to speak with an expert about radiofrequency skin tightening, request a consultation online with Dr. Petropoulos, or call her at 978-739-9500. 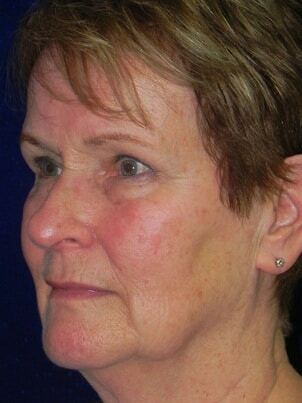 She looks forward to helping you determine your best options for looking and feeling your best. what can thermiTight™ help correct? As a member of ThermiAesthetics’ Clinical Advisory Council, Dr. Petropoulos is uniquely qualified to perform these treatments. She will help you to decide the best approach for achieving your particular goals. What types of ThermiRF™ treatments do you offer? ThermiSmooth employs non-invasive radiofrequency energy to warm up the tissues to a very precise goal temperature. This energy is delivered by a specially designed external hand piece as it is massaged over the area being treated, such as your face, neck or body. The goal temperature and the size of the hand piece are selected based on the body part and the specific condition being treated. The proprietary thermistor-controlled temperature settings and read outs support the unparalleled safety of this pleasant, gentle treatment. Patients say that this feels like a wonderful hot-stone massage that they wish would never end! After using tumescent solution to numb the area, a tiny SmartTip™ thermistor probe is inserted under the skin to heat sub-dermal tissues to a specific temperature, selected by Dr. Petropoulos. Different temperature settings can be used to tighten the skin, melt fat, and reduce the appearance of cellulite. Again the safety is unparalleled, with the thermistor monitoring and controlling the subcutaneous temperature settings. 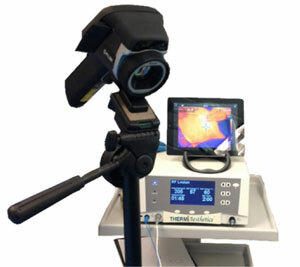 Additionally, external temperature readings are recorded simultaneously by thermal video photography using the thermal “FLIR” camera, which projects the thermal image onto a screen. 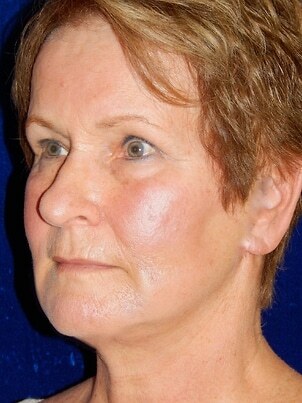 The ThermiTight procedure can be performed alone or combined with liposuction or another adjunctive treatment. 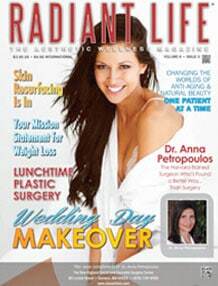 Dr. Petropoulos often combines ThermiTight with her trademarked “SkinTrim™” procedure for those who need it. She may recommend a series of KYBELLA® injections, which can get rid of stubborn fat beneath the chin. Dr. Petropoulos will work closely with you and help you decide which treatment or combination is the best for you. ThermiRF treatments have earned an astonishingly high 94% “worth it” rating from real patients on RealSelf.com, a respected cosmetic surgery forum. Dr. Petropoulos’ patients are typically thrilled with their results, and surprised by how much improvement they achieve without surgery. You can see their results for yourself by visiting our before-and-after gallery of real ThermiRF patients. If you decide that you’d like to be one of Dr. Petropoulos’ many “success stories,” request a consultation online, or call her Danvers, MA office at 978-739-9500.